Unicode this month released a draft update to TR-51, or in human terms, the document that describes what's-what's what in emoji standards. This draft is for Unicode Emoji Version 4.0: an update to Unicode's emoji documentation which can be released outside of the annual Unicode Standard release schedule. Updates planned in Emoji 4.0 include gendered emoji support, new professions, as well as the rainbow flag emoji. It's surprising how much can be done with emoji without the need for new code points. These are female or male variations of existing emojis already available today. 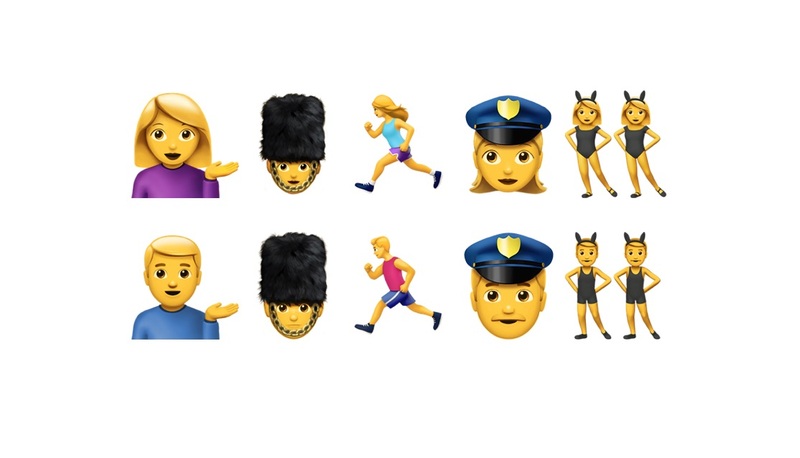 Characters possible with this update include information desk man, guardswoman, female runner, female police officer, and men with bunny ears. Early beta releases of iOS 10 are showing these characters already, despite Emoji 4.0 still being a draft. Above: Gendered Emoji Roles in iOS 10 beta. 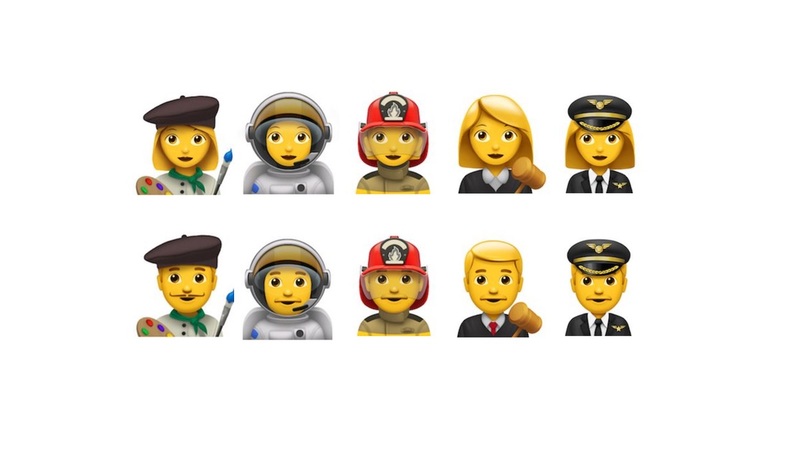 Just about any emoji that has a human appearance gets a version for both genders. There are some exceptions such as the 🤰 Pregnant Woman and 👲 Man With Gua Pi Mao. 13 new professional emojis were initially recommended by Google in their Expanding Emoji Professions proposal in May 2016. After being referred to the Unicode Emoji Subcommittee to refine the list, Apple later requested five new additions in August. Apple has some additional feedback: We suggest adding ZWJ sequences for artist, firefighter, pilot, astronaut, and judge, with proposed sequences as shown below. Above: Five new professional emojis proposed by Apple. Images: Apple. There are 16 new professional emojis in the latest list, which become 32 when female and male versions are considered. The above list is referred to as "Emoji ZWJ Sequence: Gendered Role, with object" in the Unicode data files, as they are created using an Emoji ZWJ Sequence of a Woman or Man + Object. Eg Female Judge = 👩‍ Woman + ⚖️ Scales. The 🏳️‍🌈 Rainbow Flag Emoji is documented using an Emoji ZWJ Sequence, an update that was detailed prior to Emoji 4.0. Flag for United Nations is also listed using the regional indicator pair UN in this update. Twitter has implemented a pirate flag emoji as part of Twemoji, which is not part of this update and remains undocumented. All of these are intended to be used as part of the previously-listed Emoji ZWJ Sequences for gender and professions (the health worker, in the case of ⚕ Staff Of Aesculapius). Guidelines suggest that all the characters within a ZWJ sequence should support emoji presentation individually, hence the upgrade being required if these do go ahead. Above: Samsung already gives these three characters emoji presentation. Other Unicode characters have been given emoji status in the past, such as Emoji 2.0 in late 2015, which gave emoji presentation support to characters such as the ⚜ Fleur-De-Lis and ⚛ Atom Symbol. Above: These emojis were part of Unicode long before given emoji status. Apple included these new emoji upgrades in iOS 9.1 when Emoji 2.0 was still a draft. The final version of Emoji 2.0 was published a few weeks after the iOS 9.1 release. A similar occurrence may take place with this latest emoji release, as alluded to earlier with iOS 10 betas showing some parts of Emoji 4.0 already included. Unicode maintains a list of which emojis are recommended to support skin tone modifiers. This isn't always respected by vendors, but it's the place to check that 👧 Girl should support skin tones, but 🙂 Slightly Smiling Face should not. Emoji 4.0 recommends ten existing emojis gain support for skin tone modification. Some emojis in this list include multiple people in the same character which will result in every person shown in those having the same skin tone. Windows 10 already made this change in the latest release, where the people holding hands support skin tones but must have the same skin tone as each other. No interracial holding hands here, not due to any judgement call, but because it's not technically possible while they share a single code point. 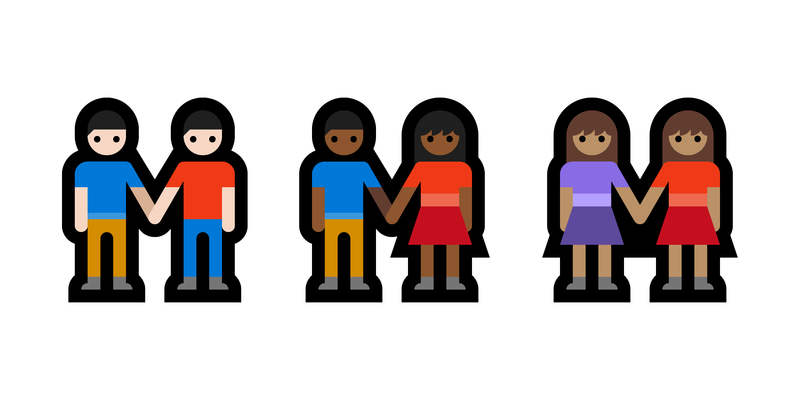 Above: Skin tones applied to people holding hands must apply to both people. Other emojis didn't previously support skin tones due to showing little or not skin on most platforms. 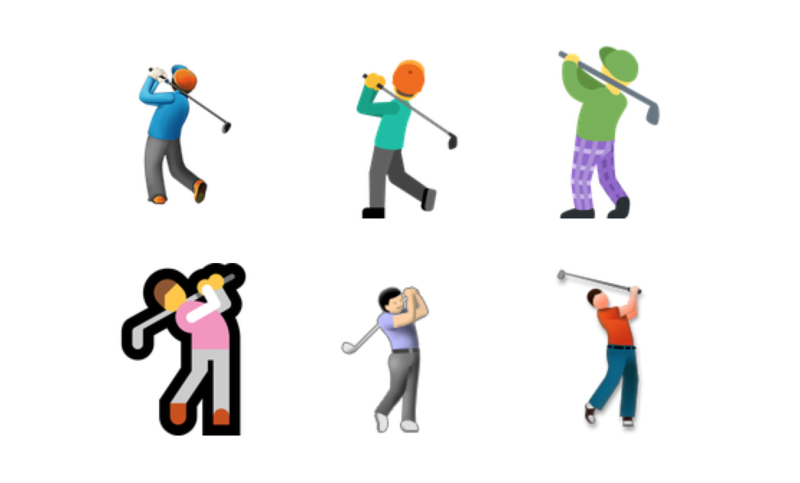 The golfer, for instance, does not show a face or hands on iOS, but does on Windows, Samsung and LG. Above: Golfer doesn't always face away, so is getting skin tone support. Lastly, the 🕴 Man in Business Suit Levitating has previously been considered more of an icon than a true human character. That's his origin, but given his yellow skin tone, it's possible to see why this might as well be considered a human, and thus get skin tone support too. The goal of this update is primarily focussed around gender updates which are considered by many to be overdue. Related to this topic has been the issue of gender neutrality, which I discussed with Unicode President Mark Davis on Emoji Wrap Episode #1. Emoji 4.0 does permit a third state, whereby an emoji with no female or male symbol attached could be made gender neutral, if vendors wished to do this. Another possibility in future is a specifically gender-neutral ZWJ sequence, like the male or female versions. Unrelated to this Emoji 4.0 release are any emojis which need new codepoints, such as the orange heart, chopsticks, or curling stone which are candidates for Unicode 10.0 in 2017. 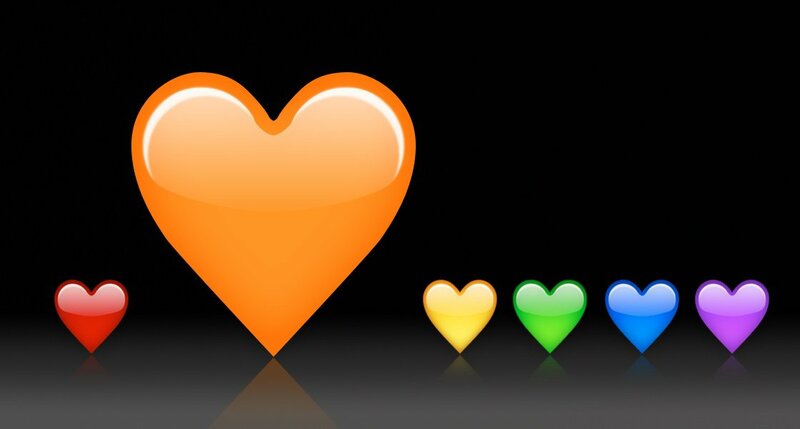 Above: Orange Heart is an emoji candidate for Unicode 10.0 in 2017. Also excluded from this update is the ongoing work for supporting additional flags such as those of England, Scotland and Wales. Work on subregion flag sequences is currently planned for a future release, likely in 2017. The review period for Emoji 4.0 closes in exactly two months from today, and public feedback can be submitted directly to Unicode. Emoji 4.0 is planned for release in November 2016, which means any or all of the above changes are likely to come to most systems in late 2016 or early 2017.